No.fifty6 was built in 1923, as was most of the village of La Boisselle, following its obliteration during the First World War. The house is situated behind the German front line of 1916 and the house boasts views across Mash Valley toward Ovillers Military Cemetery and Thiepval beyond. Julie and David have brought warmth back to this charming B&B, creating a home from home for the discerning traveller, whether solo, couples, friends or families. Guests are free to use the lounge which has an extensive library of history books and objets d'art and leads onto the rear garden and terrace, with views over pasture land to La Boisselle church. The new light and airy dining room has an enormous terrace for watching the sun go down over Mash Valley. Just perfect for relaxing after a long day exploring, with something cool and refreshing in your hand. From Florentine cypress trees to Lawrence of Arabia, the wit of Oscar Wilde to Land Speed Record and F1 heroes, this witty couple have tastefully decorated each of the five bedrooms with a nod to their own eclectic style and personality. 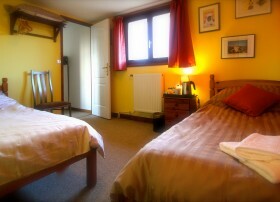 You can view the rooms by clicking on the images below. 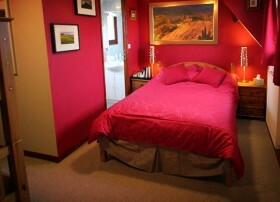 If you have a preferred room, please fill out the form below or contact us to arrange bookings. 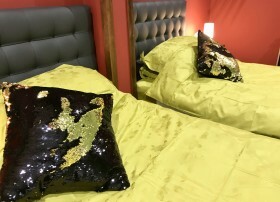 All rooms have an ensuite shower room, tea and coffee making facilites (for that early morning cuppa in bed) and secure guest wifi. 100% cotton towels are provided for each guest and your room is serviced daily. The Senna Room is on the ground floor. And after that good night's sleep under Egyptian cotton bed linen, breakfast cooked to order and served in the dining room is included in your stay. You won't find us on any hotel booking sites, Airbnb etc. as we prefer the personal approach from start to finish. 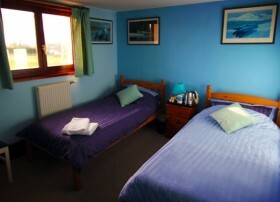 I double bedroom with 2 extra bunk beds, and an en-suite shower room. 4 twin rooms with en-suite shower rooms. Secure guest wifi throughout the house. A comfortable lounge with TV, games and extensive library. A garden room with large windows so you feel you are part of the garden while still inside. Great for reading or writing those travel diaries! A delightful new light and airy dining room where you’ll be served cracking breakfasts each morning, and dinner in the evening if you choose to dine in, beautifully cooked using fresh and local ingredients. Front terrace with plenty of seating. A private courtyard with car parking and locked gates at night. A rear garden with plenty of seats, the perfect place to unwind after a long day. Packed lunches for your day out exploring also available on request. While you are here our home is your home.